European Commission - PRESS RELEASES - Press release - 2018 road safety statistics: what is behind the figures? The European Union has some of the safest roads in the world. Nevertheless, more than 25 000 people still lose their lives on EU roads every year, and many more are seriously injured. This is an enormous loss for individuals, families and society as a whole. In 2018, around 25 100 road fatalities were reported by the 28 EU Member States. This is a decrease of 21% compared to 2010. Last year, the average fatality rate in the 28 EU Member States was 49 road deaths per 1 million inhabitants, which represents a 1% decrease compared to the previous year. This means that it is unlikely that the target of halving the number of road deaths by 2020 will be reached. Determined and well-focused efforts are now needed at all levels and across all sectors. How did the Member States perform in reducing road accident fatalities in 2018? As an overall trend, the performance gap between EU Member States has been narrowing year by year. Following a pronounced discrepancy in Member States' road safety records up until the 1990s, a clear convergence followed from 2000. Last year, only two EU Member States recorded a fatality rate higher than 80 deaths per million inhabitants, against seven in 2010. In 2018, the majority of Member States had a road fatality rate of below 60 deaths per million inhabitants. For eight countries, the figure was below 40 per million inhabitants. According to the preliminary figures for 2018, the Member States with the best road safety scores are the United Kingdom (28), Denmark (30) and Ireland (31). On the other hand, Member States with the highest fatality rates were Romania (96), Bulgaria (88), Latvia (78) and Croatia (77). While the average decrease in the number of road deaths was only 1% for 2017-2018 for the EU as a whole, some countries made a lot of progress, such as Slovenia with a 13% drop, Lithuania with 11%, Bulgaria with 9% and Slovakia and Cyprus with 8%. It is also important to note that the period 2010-2018, the biggest drop in the number of road deaths was reported by Greece (45%) and Lithuania (43%), followed by Portugal (35%) and Slovenia (34%). The EU-wide average decrease for the same period was 21%. NOTE: Detailed data for 2018 is not yet available. The following sections are based on analysis of trends derived from road safety statistics (most recently 2017). 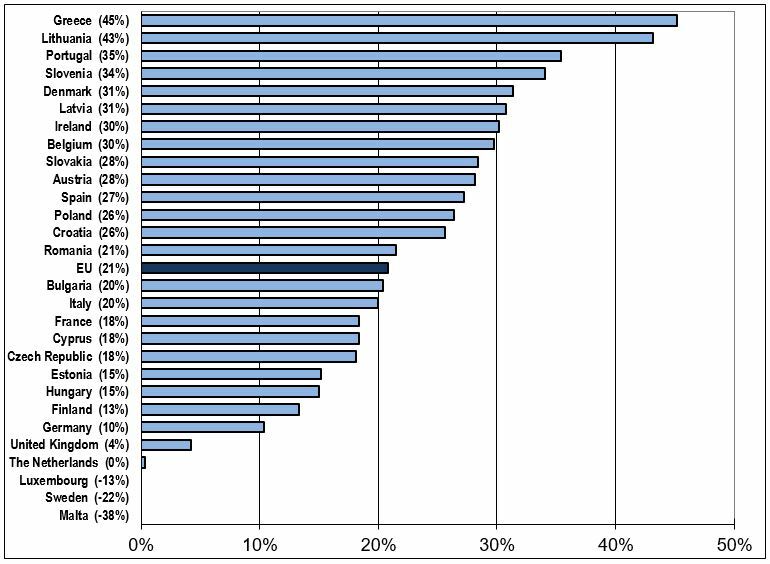 Which road users and which types of roads are the most affected? While fatality rates have decreased across the board, figures for car drivers and passengers have improved the most. This is because cars have become safer. The smallest improvement is for vulnerable road users: unprotected cyclists and pedestrians, riders of powered two-wheelers and the elderly, especially in urban areas. Vulnerable road users account for almost half of road accident victims. For every person killed in traffic accidents, about five more suffer serious injuries with life-changing consequences. Serious injuries are often more costly to society because of long-time rehabilitation and healthcare needs. The majority of those injured are vulnerable road users, i.e. 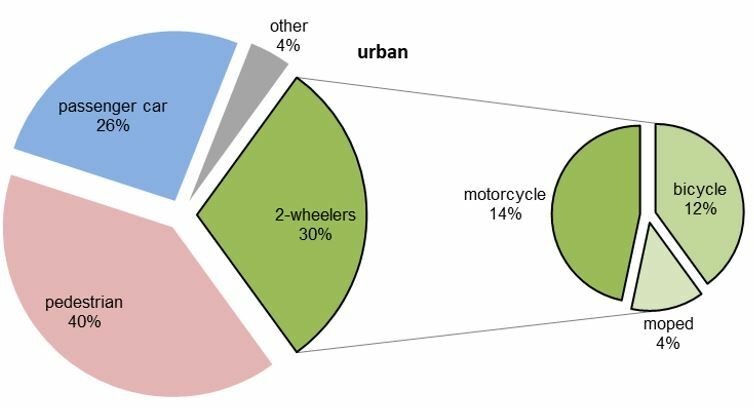 pedestrians, cyclists and drivers of powered two-wheelers. Vulnerable road-users account for an even higher proportion of those injured in towns and cities. In 2017, 21% of all people killed on roads were pedestrians. In general, pedestrian fatalities have decreased at a lower rate than for other road-users (by 15% from 2010 to 2017, compared to a total fatality decrease of 20%). Cyclists accounted for 8% of all road accident victims in 2017. The number of cyclist fatalities decreased by only 2% between 2010 and 2017, which is much lower than the total fatality decrease (20%). Motorcyclists accounted for 15% of road accident fatalities. 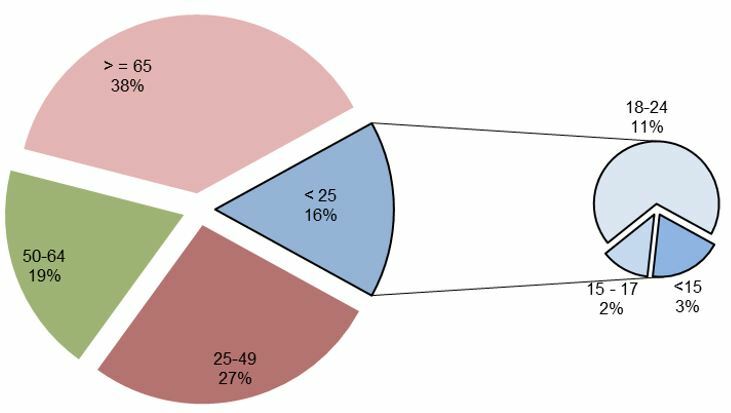 In 2017, 34% of all road accident victims were in the age group of 25-49. Almost 13% of those killed on EU roads were aged between 18 and 24, while only 8% of the population falls within this age group. This means that young people are much more at risk than the average population. The majority (67%) of young people killed in road crashes were drivers, while only 8% were pedestrians. In general, the average age of road accident victims in the EU is on the rise. While 18% of road fatalities concerned elderly people in 2010, this figure reached 28% in 2017. Those over 65 years old are especially at risk as pedestrians. 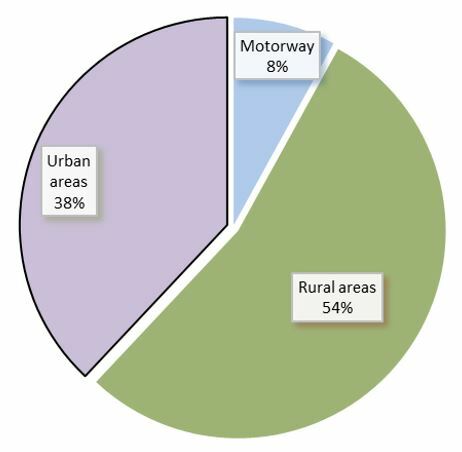 Overall, only 8% of road accident fatalities in 2017 occurred on motorways, versus 54% on rural roads, and 38% in urban areas. In 2017 and for the EU as a whole, roughly 19 people per 1 million inhabitants died in urban road accidents. But the rate differs significantly from one Member State to another. Generally, the rate of road fatalities occurring in urban areas is below average in most northern and western EU countries. Latvia, Finland, Luxembourg and Austria had the lowest proportion of urban road fatalities compared to the total fatalities (25% or below). On the other hand, in Romania, Croatia, Greece, Portugal, Malta and Cyprus, more people were killed in urban areas than on rural roads, in particular pedestrians. Accidents in urban areas are different, in character, to accidents on rural roads and motorways. First, within urban areas, pedestrians and not the car occupants account for the largest share of victims: Inside urban areas, 40% of the fatalities are pedestrians, 12% are cyclists and 18% are powered two-wheelers. This means that 70% of the total fatalities in urban areas are vulnerable road users. Outside of urban areas, this percentage is 34%. The elderly are particularly vulnerable in urban areas – they accounted for a higher percentage of fatalities from urban road accidents in 2017 than other age groups. This could be explained by the fact that trips made by the elderly are usually short, mostly involve walking, and do not often involve going outside urban areas. This trend is inverted for those aged 18-49, for whom the percentage of fatalities is clearly higher outside urban areas. 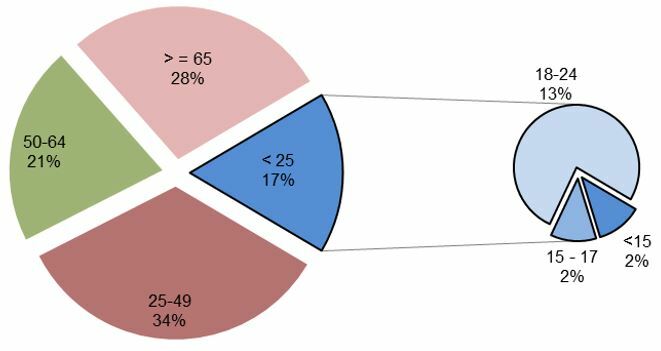 In addition, elderly people are clearly over-represented in fatality figures: in 38% of all fatal accidents in urban areas, the victim is aged 65 or more. So urban area road safety is closely linked to the safety of vulnerable road users. What steps have been taken recently at EU level for safer roads? In its new policy framework for road safety 2021-2030, released in May 2018, the European Commission confirmed the EU's long-term goal of moving close to zero fatalities and serious injuries in road transport by 2050. Its new interim targets, responding to the call of the 2017 Valletta Declaration, are to reduce the number of road deaths by 50% between 2020 and 2030 as well as to halve the number of serious injuries in the same period. In addition, the Commission is working with Member States on a set of key performance indicators directly related to reducing death and serious injury. To make the vehicles we drive even safer, the Commission proposed to introduce new safety measures in cars, lorries and buses as part of the General Safety Regulation, on which the European Parliament and Council have just reached agreement. Motor vehicles will be equipped with new, advanced vehicle systems, such as intelligent speed assistance; advanced emergency braking and lane-keeping systems; frontal protection systems; driver drowsiness and attention monitoring, and event (accident) data recorder. Buses and lorries will also be equipped with advanced systems capable of detecting vulnerable road users. This legislation alone could save 25 000 lives within 16 years of coming into force. To make infrastructure safer, the EU has also strengthened the rules on infrastructure safety management, the co-legislators having reached agreement in February 2019. In the future, infrastructure safety will be assessed more systematically and more proactively for more roads in the EU, helping to target investment. Transparency and follow-up will be improved, and the same advanced safety procedures will apply on roads linking major cities and regions as on the EU's strategic road network (TEN-T). It will also pave the way for automated assistance and prepare for autonomous driving across the EU, as well as the benefits these developments will deliver. Vulnerable road users will have to be taken into account systematically. On 28 March 2019, the Commission and the European Investment Bank (EIB) jointly launched the ‘Safer Transport Platform', providing advice and technical assistance on funding and financing options for investment in transport safety, with a particular focus on road safety. Finally, in order to close the 'road safety gap', which still exists between different EU Member States, a new pilot project was launched early this year with the financial support of the European Parliament, focusing in particular on a number of countries who have to do the most to catch up with the European average. The ‘EU Road Safety Exchange' aims to develop partnerships between road safety professionals of different European countries and to address their specific road safety problems through sustained twinning activities. All information, statistics and best practices as well as studies and project reports can be found on the Commission website. Austria: Austria's road safety performance has improved more than the EU average since the beginning of the decade (28%), coming down to 45 deaths per million inhabitants in 2018. 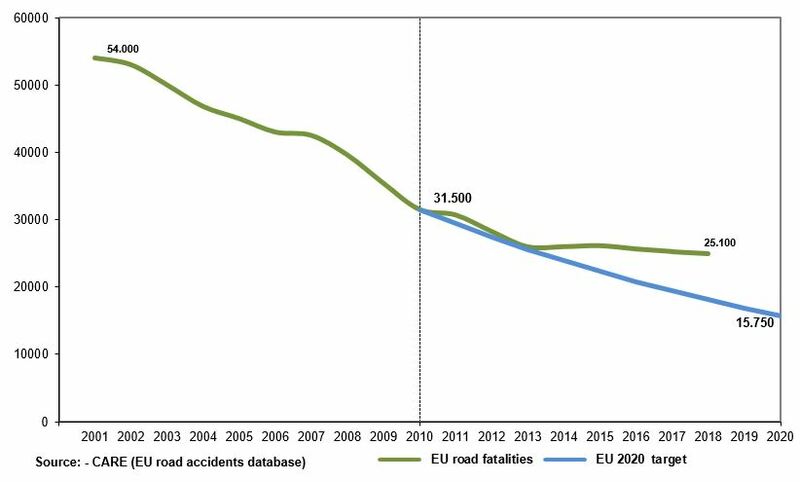 Belgium: The number of road fatalities per million inhabitants in Belgium is slightly above the EU average (52 deaths per million inhabitants), and has improved by 30% between 2010 and 2018. Bulgaria: The number of road fatalities per million inhabitants in Bulgaria (88) is the second highest in the EU despite a 9% decrease compared to the previous year. Croatia: Following good progress in lowering the number of road accident fatalities from 2010 (-26%), the number of deaths decreased by a further 4% in 2018, reaching 77 per million inhabitants. Cyprus: The number of deaths decreased by 8% from 2017 to 2018 (57 fatalities per million inhabitants in 2018 compared to 62 in 2017). However, because of the country's small size, the figures tend to fluctuate from year to year. Czech Republic: The number of road fatalities per million inhabitants is above EU average, and increased by 14% since the previous year, from 55 to 62. Denmark: Denmark has an excellent road safety record, well below the EU average, with 30 deaths per million inhabitants both in 2017 and in 2018. Estonia: After years of impressive results, Estonia's fatality rate reached 51 deaths per million inhabitants in 2018, compared to 36 in 2017, representing a 40% increase. As Estonia is a relatively small country, the figures tend to fluctuate from year to year. Finland: Finland's road safety results are better than the EU average with 43 deaths per million inhabitants. This represents a small (1%) reduction compared to 2017. France: France reduced the number of road fatalities by 5% in 2018 compared to 2017. Thus, the road accident fatality rate in France is slightly below EU average, with 48 deaths per million inhabitants in 2018. Germany: Germany performs better than the EU average, with 39 deaths per million inhabitants, even if it recorded an increase of 3% in 2018 compared to the previous year. Greece: Greece has made impressive improvements in its road safety performance since 2010 (45%). However, the number of road fatalities in Greece is still considerably higher than the EU average: 64 per million inhabitants in 2018. Hungary: Hungary's road safety performance is below the EU average. In 2018, 64 people per million inhabitants died on Hungarian roads, representing a 1% increase compared to the previous year. Ireland: Ireland was the third-best performer in road safety in 2018, with 31 deaths per million inhabitants, and improved by 30% between 2010 and 2018. Italy: The road fatality rate in Italy improved by 20% in 2018 compared to the 2010 figure, with an estimated 55 fatalities per million inhabitants in 2018. Latvia: Although Latvia has achieved an impressive 31% decrease since 2010, last year its road safety score deteriorated by 10% compared to 2017. With 78 deaths per million inhabitants, Latvia needs sustained efforts to reach the EU average. Lithuania: The road fatality rate in Lithuania improved by 11% in 2018 compared to the 2017 figure, sinking to 61 deaths per million inhabitants. However, this rate is still above the EU average (49). Luxembourg: Provisional data show a deterioration in the country's road safety record in 2018, with 60 deaths per million inhabitants in 2018 compared to the previous year. As for all small countries however, the figures tend to fluctuate considerably from year to year. Malta: In 2018, Malta registered 38 road fatalities per million inhabitants, below the EU average. This means a 5% decrease compared to the previous year. Due to its small population, this figure tends to fluctuate from one year to the next. Poland: Poland has made good progress over the last decade, with a 26% decrease from 2010 to 2018, but still reports a higher number of road fatalities than the EU average (76 per million inhabitants compared to the EU28 average of 49). Portugal: Portugal has achieved a significant decrease in the number of road fatalities per million inhabitants since 2010 (35%). The fatality rate slightly increased by 1% from 2017 to 2018, to 59 fatalities per million inhabitants. Romania: Romania's road safety performance improved by 4% between 2017 and 2018. 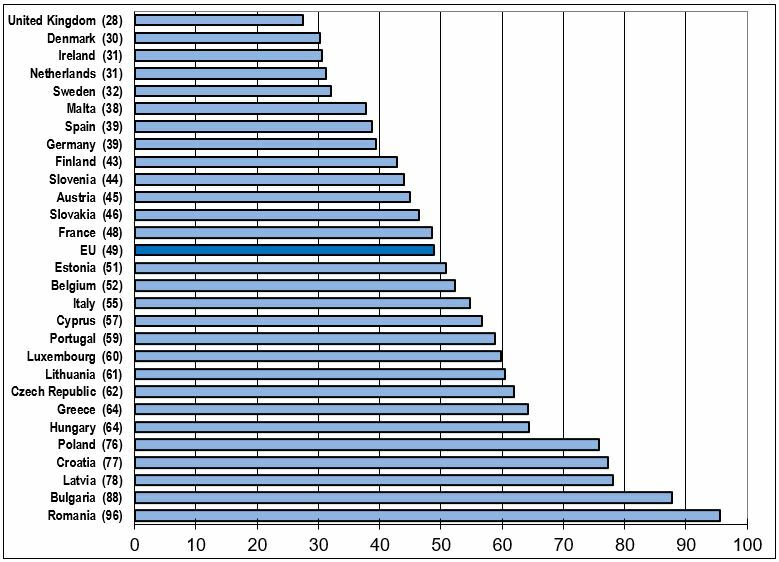 However, Romania is still at the bottom of the EU performance list, with 96 deaths per million inhabitants last year. Slovakia: Slovakia has improved its road safety performance since 2010 by 28% – more than the EU average. In addition, from 2017 to 2018, Slovakia registered an 8% decrease in the number of road deaths, reaching 46 fatalities per million inhabitants. Slovenia: Slovenia has made good progress in its road safety performance, ranking now above the EU average with 44 deaths per million inhabitants, representing a 13% decrease from 2017 to 2018. Given the small size of the country, the figures tend to fluctuate from year to year. Spain: Spain is doing well as regards road safety, maintaining its position among the good performers with 39 deaths per million inhabitants last year. Sweden: Sweden was the fifth best performer in road safety in 2018 with 32 deaths per million inhabitants. Sweden is consistently among the top performers, even though it registered a significant increase (28%) in the number of fatalities from 2017 to 2018. The Netherlands: In recent years the Netherlands have maintained a very good road safety record, recording 31 fatalities per million inhabitants in 2017 – well below the EU average of 49. The Netherlands have not yet released provisional figures for 2018. United Kingdom: The UK has continued its excellent road safety record with an estimated 28 fatalities per million inhabitants in 2018. The Netherlands have not released data for 2018; figure is based on 2017 data. Figures for the UK are an estimation based on data up until June 2018. The Netherlands have not released data for 2018; figure is based on 2017 data. Figures for the UK are an estimation based on data up to June 2018.